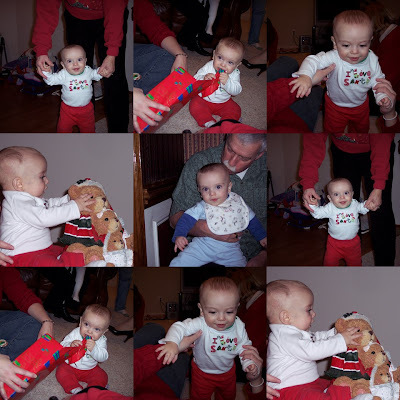 Well, the real blogger did not take her turn to post the Thanksgiving pictures, so the mystery blogger has to post a few before Christmas pictures. Hopefully the real blogger will start with the First Christmas pictures as soon as 12/25/2007 comes and goes. Thanks for filling in for the original blogger. Teddy is such a doll. I look forward to seeing his theme shirts for all his activities. What cute pictures!! !He is absolutely adorable!